Aikatsu! – 176 | Mezashite! The Wheel of Fate is turning. Will it remain upright, or will it invert? By the way, I’m hosting two panels at Anime Boston this week! One is titled Idol Activities, Friday morning bright and early at 10 AM. The other is about Okada Mari, Sunday at noon. Come and check them out if you’re attending. The Wheel of Aikatsu turns, and Queens come and pass, leaving top idols that become legends. Legends fades to myths, and even myths that are long forgotten when the Age that gave them stardom comes again. In one Age, called the Hoshimiya Age by some, an Age yet to come, an age long pass, a wind rose in the Starlight Academy. The wind was not the beginning. 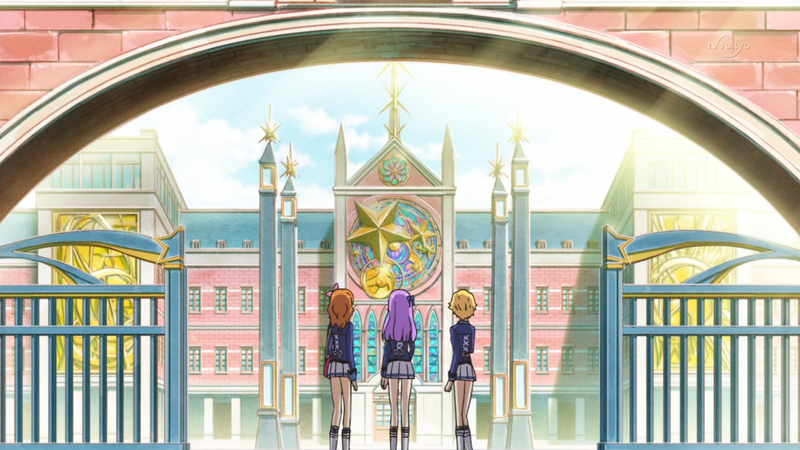 There are neither beginnings or endings to the turning of the Wheel of Aikatsu. But it was “a” beginning. I feels so bad for sumari. I’m still trying to figure out Sumire-chan’s “these are not the droids you seek” gesture to Hinaki-chan…. She’s fixing her hair braid. Such a great birthday present, thank you! I’m dying to see the next episode! WIll Hinaki take the crown or Akari?? Will being in Boston this weekend delay your subbing of episode 177? I know they’ll get 177 done before 178 airs… I was thinking more like this weekend. Most of the recent episodes have been coming out on Saturday or Sunday, and I’m just anxious to see all that dialogue translated; I can only pick out small bits here and there on my own. But it will come out when it comes out.